Wait, does that call for mashed potatoes in the candy?? When I think of making candy, I think of mashed potatoes! Actually, no, I have never thought of that. I am perplexed by this ingredient and I don’t know if I will be trying it. 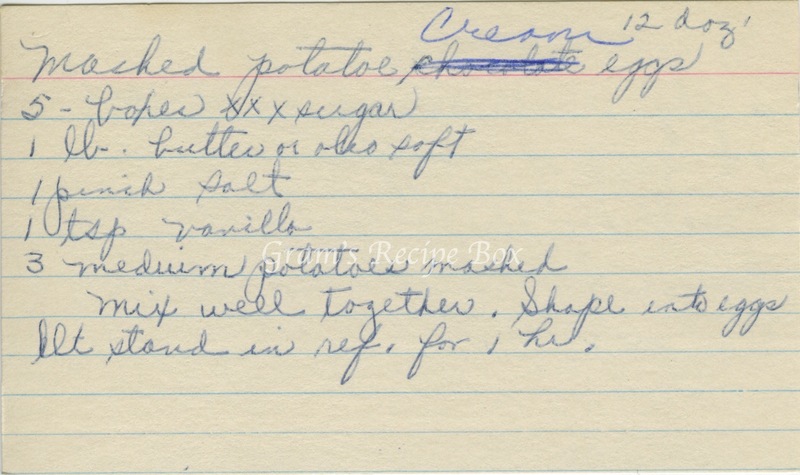 Does anyone have an idea of why the recipe uses mashed potatoes? Mix well together. Shape into eggs. Let stand in refrigerator for 1 hour. 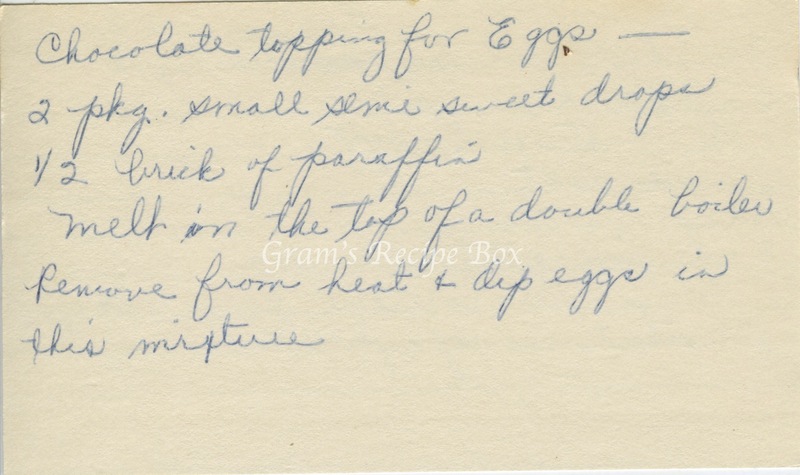 Melt in the top of a double boiler, remove from heat and dip eggs in this mixture. I will say this, one of my friends has a recipe for make at home York Peppermint Patties and she made us all taste them (at a cookie exchange) before she told us the secret ingredient was mashed potatoes. You seriously would not have known. I’m guessing it’s for the creamy factor, but I probably would never even think this this sounds appealing if I hadn’t tried her treats first. Forgot to add that the “pinch of salt” added to 5 whole boxes of powdered sugar made me laugh. Really, a pinch is going to be that noticeable and make that much of a difference?!? It just struck me as funny.